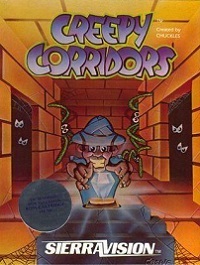 Creepy Corridors was originally one of the four games included in Laf Pak, also designed by Chuck "Chuckles" Bueche. The game was remade for the IBM PC/PcJr under the title Mineshaft. Interestingly, the front cover of the box clearly reads the name "Crowe". That would be Mark Crowe, most known as being one of the designers of the Space Quest series. The box cover was one of the (if not 'the') first artwork Mark did for Sierra.